Hey all! Two new folks have signed up to follow IADW, using the 'follow' option - tucked handily over in the right-hand column! Zawisza, you've seen in the comment section, but have you checked out his blog that serves as the reference for all things Doom Patrol? Check out the guff on DC's family of freaks at mygreatestadventure80! 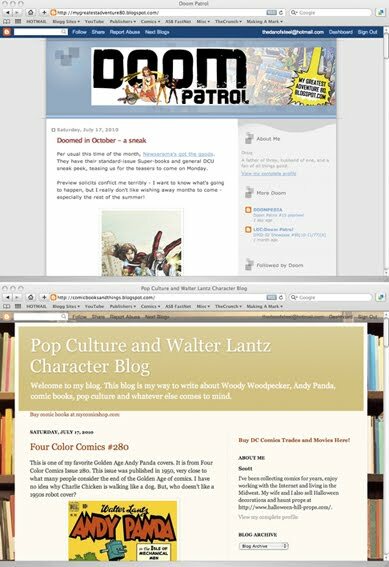 Scott runs the Pop Culture and Walter Lantz Character Blog, dedicated to all things Woody Woodpecker, Andy Panda and more! Check out the retro goodness, here. To Zawisza and Scott - thanks for following IADW! Happy to be here, as always! I love this place!